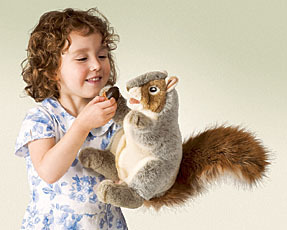 In the tradition of Folkmanis' award-winning wildlife puppets, comes this gracefully detailed Gray Squirrel Puppet. Featuring rich plush, a movable mouth and thread whiskers, this inquisitive squirrel comes with his own acorn so he won't need to raid the nut bowl! Measures 11" long x 7" wide x 12" tall.